It is suitable for the testing the fire resistance of building materials / products in single burning item (SBI). 1. The core part of the machine are imported components: such as carbon dioxide, oxygen analysis equipment. 2. Operating interface style and performance equivalent to the United Kingdom FTT, some performance is better. 3. Easy maintenance, fast, late parts replacement than FTT minimum less than 50% to 70%, there will be no maintenance problems. 4. With imported integrated control cabinet. 1. 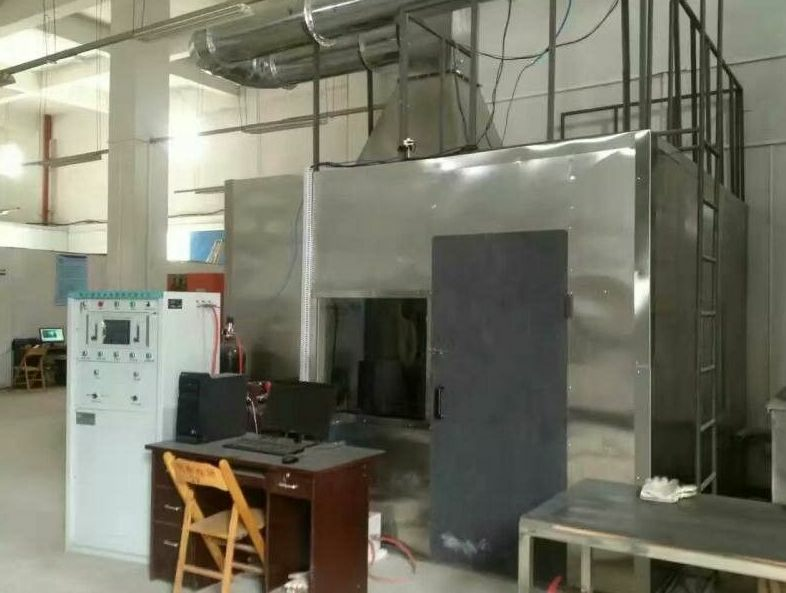 Composition: this test equipment includes combustion laboratory, control room, 2 small carts, exhaust pipe, fixed frame, flue gas collection system, integrated measurement system device, data collection and analysis device, gas supply control device. 3. Combustion chamber: long (3.0 ± 0.2) m × width (3.0 ± 0.2) m × high (2.4 ± 0.1) m.
5. At the top of the room there is a collecting hood and a smoke pipe connecting the sampling piping. The combustion heat release and combustion products of the sample are discharged from the exhaust pipe during the test. 6. Combustion chamber on a wall set up an opening, easy to enter the small cart, under the trolley air naturally out of space; vertical test plate on both sides of the front surface of the two sides were opened on the observation window. 7. Ignition source, placed in the trolley on the vertical corner of the 31KW propane right angle sandbox burner (side length 250MM high 80MM). 8. The position of the cart is to place the opening of the cart on the back of the cart just to close the openings in the combustion chamber wall. To distribute the airflow evenly along the combustion chamber floor, a perforated plate (perforated) is arranged at the air inlet at the bottom of the trolley Diameter 8mm, open area accounted for 60% of the total area). 9. With adjustable governance fixture, loading and unloading samples is very convenient. 16. Record data acquisition system can collect oxygen concentration, carbon monoxide concentration, temperature, smoke density, heat release rate, mass loss rate, etc., can be stored. The combustion performance of the sample was evaluated by the entire test procedure of 20 min. Performance parameters include: heat release, smoke production, flame propagation and burning dripping and particulate matter. Prior to igniting the main burner, the heat output and smoke generation of the burner itself should be measured for a short time using the auxiliary burner remote from the sample. Some parameters can be measured automatically, while others can be obtained by visual inspection. The smoke pipe is equipped with a sensor for measuring the temperature, light attenuation, the mole fractions of O2 and CO2, and the airflow in the pipeline. These values are automatically recorded and used to calculate the volumetric flow rate, heat release rate (HRR) and smoke rate (SPR). The transverse propagation and burning of the flame and the particulate matter can be measured using a visual method.